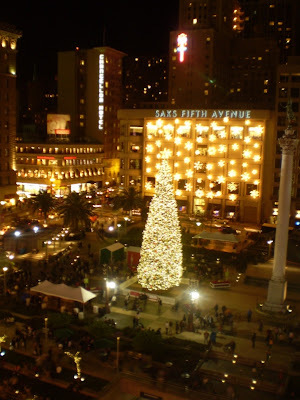 I checked out Union Square in downtown tonight, which is newly decked with Christmas decorations, masses of shoppers, and crazy traffic jams. Union Square is pretty much the retail hub of San Francisco, and everytime I go there, something interesting is happening. There is almost always some band playing interesting music on the corner of Geary and Powell, and tonight was no different-- with a trio comprised of crazy-funky bass, drums, and 6-year-old kid (I think the drummer's son) break dancing to the music. The last band I saw there was three guys doing experimental music with a didgeridoo. 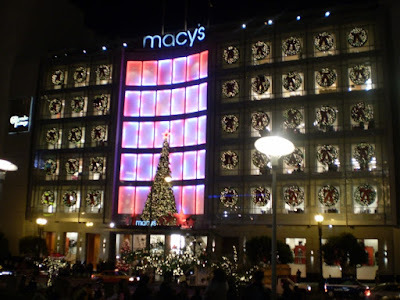 By the way, I have learned that the best place to find a nice bathroom downtown without having to eat at a restaurant is the sixth floor of Macy's. I have only shared this knowledge with one other person so far, so let's keep it our little secret. Of course no trip to a shopping district the day after Thanksgiving is complete without some Christmas shopping, so I picked up some awesome things at... ha ha, it will have to stay a surprise! Pictures below... as always, click to enlarge. LOL I think I hit the Macy's restroom last time I was in Union Square.